When I slide the back strap down, there is an opening at my nose where the light gets in so I can only watch psvr properly with the strap way up on my head which doesn't feel good or secure, any advice? I adjusted the title to draw in some help. I think @Cale Hunt @James Bricknell and @Chemy JMHT have PSVRs. I will try to get them to come help. Hey so the PSVR is a little weird. The strap is supposed to be high and tight instead of low. There has to be a little Gap in the visor to stop fogging so some light will come. 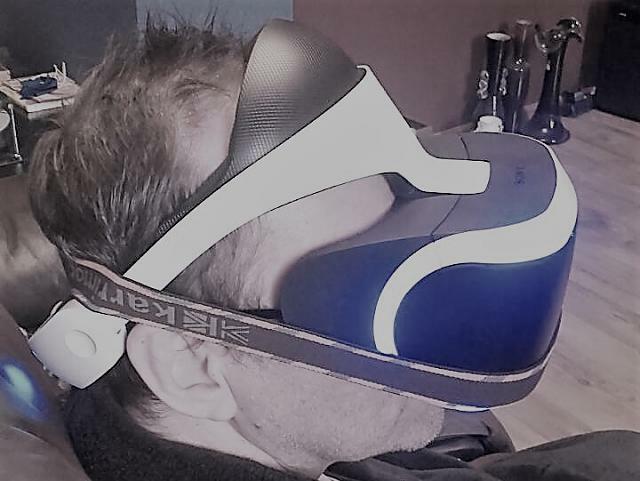 A follow up: I had a play around with my positioning of the PSVR and found that having the strap high and the forehead strap low completely removes external light. the strap is a little weird at first, but if you have it nice and tight you soon get used to it and can ignore the headset all together. Chemy JMHT and pkcable like this. It's matter of trying, try to adjust it while wearing it in several positions in order to get the best fit and experience, it's very different for each person. Just want to make sure that you're using the button on the bottom of the display part to adjust the proximity to your face. This always helps me block out most light, but there still might be a bit getting in. (1) Strap fully around the head and bottom of the display is making a gap that not only passes the external light but also makes the display not sharp. (2) Strap way up on the head and display becomes sharp and filters properly external light but implies uncomfortable feeling that in a few seconds it could drop off my head. I know this looks crazy but it works. I took another elastic strap from my head flashlight and: (a) Put PSVR strap down as it should be to feel comfortable (then the bottom of the display is far away from my nose (b) Put the second strap in such a way that it doesn't hide any of the 5 front lights of the display but is positioned on the bottom of it and goes around my head above the PSVR strap, so the bottom of the display fits perfectly to the nose. parallel line from your ears, also because of that the forehead placement is too high. Try it that way to see if it's more confortable for you. What case fits with a Geforce 1070? Do I need a specific type of headset or does it just have to be surround sound?